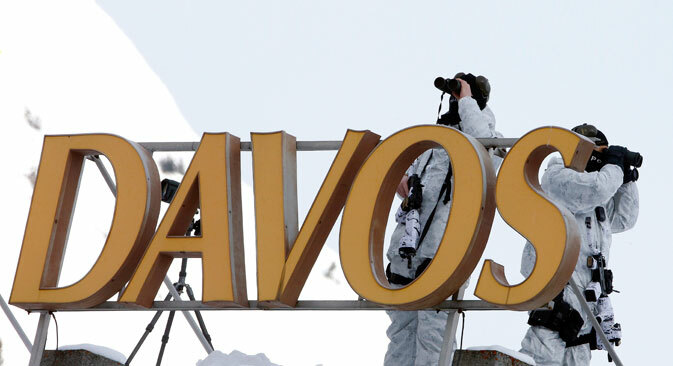 The World Economic Forum will be held in Davos from January 20-23. The Russian delegation at the Davos Forum will be headed by Yury Trutnev, a deputy prime minister and the Presidential Plenipotentiary Envoy to the Far East. According to experts, this means that Russia will primarily focus on the presentation of Asian projects at the forum. Neither the president nor the prime minister will travel to Switzerland. The Russian delegation at the World Economic Forum, to be held in Davos, Switzerland from January 20-23, 2016, will be headed by Yury Trutnev, a deputy prime minister and the Presidential Plenipotentiary Envoy to the Far East. Trutnev was previously in charge of conducting an economic forum in Vladivostok. This information was confirmed to the Russian business daily Vedomosti by Natalia Timakova, a spokeswoman for Russian Prime Minister Dmitry Medvedev. According to experts, this decision indicates that the main theme for the Russian delegation in Davos will be the “pivot to the East,” an approach to increase the cooperation between Russia and Asian countries, which was enunciated in 2014. “Russia is ready to demonstrate to investors from Asia its readiness for the joint development of various projects primarily in the Far East, since this region corresponds to their economic interests,” said Georgy Vashchenko, head of Russian stock market operations at the Freedom Finance investment company. According to Vashchenko, projects in the energy, oil and gas and aviation sectors are most likely to be discussed. It became known in early January 2015 that one of Russia's largest steel corporations, Norilsk Nickel, will sell 13.33 percent of its Bystrinsky deposits – Russia's largest reserves of copper – to Highland Fund, a consortium of Chinese investors, for $100 million. Timakova told Vedomosti that in Davos Russia will promote the Asia-Pacific agenda and the Far Eastern Economic Forum. This will form the bulk of Trutnev’s work there. As part of the review session on Russia, a discussion on macroeconomics and low oil prices, new trade and investment associations in Asia and Russia's role in the international security system are planned. The panelists will include the Central Bank's chief, Elvira Nabiullina and former Finance Minister Alexei Kudrin, who is widely regarded as a strong advocate for liberal reforms in Russia. According to Anatoly Vakulenko, an analyst at the Finam investment holding company, Russian proposals will be addressed not only to Chinese investors, since China has already had ample opportunity to get acquainted with the Far Eastern projects and investment opportunities connected with them. Therefore, the proposals will be directed primarily to European and possibly Middle Eastern investors, Vakulenko added. In 2015, the forum's Russian delegation was headed by First Deputy Prime Minister Igor Shuvalov and by Deputy Prime Minister Arkady Dvorkovich the year before that. The forum's organizers sent invitations to Russian President Vladimir Putin and Prime Minister Dmitry Medvedev, but they have not participated in the forum over the last few years. However, the forum is regularly attended by heads of state and government. In 2009, the Russian delegation in Davos was led by Putin, who was the prime minister at the time, and by Medvedev in 2013. German Chancellor Angela Merkel also declined to participate in this year’s forum. Yury Trutnev was appointed deputy prime minister and the presidential envoy to the Far East in 2013. In September 2015, he conducted the first East Economic Forum in Vladivostok, which resulted in more than 80 large investment contracts worth over 1.3 trillion rubles ($17.2 billion). Trutnev previously worked as an aide to the Russian president, and headed the Ministry of Natural Resources from 2004 to 2012. This ministry is responsible for issuing licenses for the development of oil fields in Russia, among other tasks. In 2009 and 2012, he was listed as the richest member of the government, earning 155 million rubles (about $5 million according to the exchange rate at the time) and 210 million rubles ($7 million at the time), respectively.